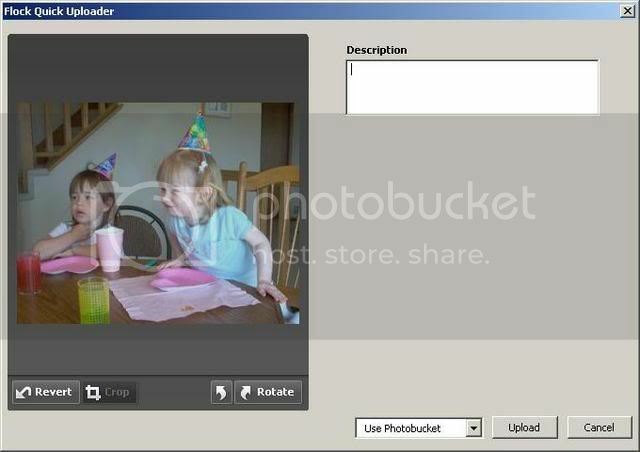 Now you can just click an paste pictures into the Flock blogging tool. 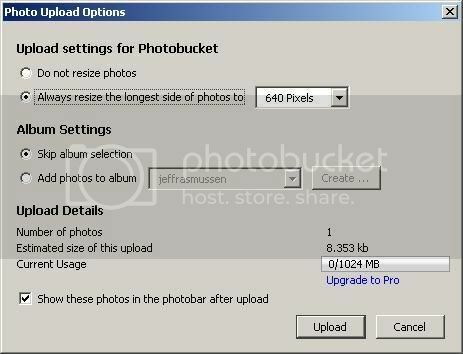 This will prompt an automatic Photo uploader (Flickr or photobucket), ask for some tagging, allow you to automatically size the photo, and paste the link to Flickr or Photobucket into the blog entry. This is so slick, you need to download Flock and try it. This currently only works with hosted blogging services: WordPress, TypePad, Movable Type, LiveJournal, Drupal, and Blogger. 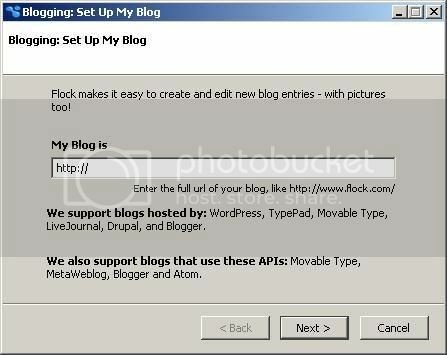 It does support private blog services that use these APIs: Movable Type, MetaWeblog, Blogger, and Atom. I switched from blogging on Bloglines.com to Wordpress.com just because of Flock. I liked the idea enough to try out Wordpress.com and liked it enough to move all new posts to Wordpress.com. Because of Flock, I am actually using my Flickr account and now have signed up with photobucket to see if I prefer their service. What I have seen so far is that I have two services that can host my pictures and from a blogging perspective, it doesn't matter where the pictures are stored. If I fill up Flickr, I can just start posting to photobucket and vice versa. You also are explicitly given a local save option in the blogging tool which saves to a sane location like "My Documents\Flock Blog Posts"
I'm also very happy with the Linux version. After creating a launcher pointing to /home/username/flock/flock, I was able to use the xpm icon located in the same folder and drag it onto my gnome panel.